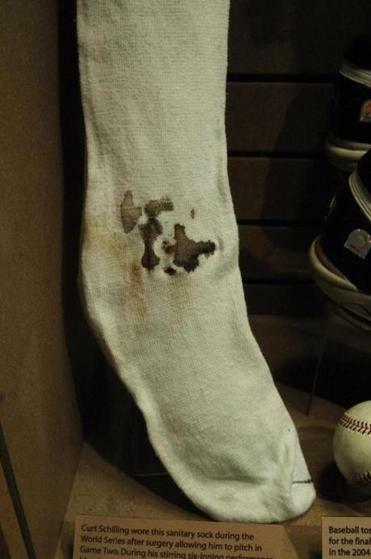 Curt Schilling’s bloody sock from the 2004 World Series could fetch around $25,000. The bloody sock that came to symbolize one of Curt Schilling’s greatest victories could also play a starring role in one of his biggest losses. The former Boston Red Sox pitcher could be forced to sell a “bloody sock” he wore while leading the Sox to their first championship in 86 years, among other cherished items, to help pay back millions of dollars in loans he guaranteed for his failed ­video game company, 38 ­Studios. The sock, worn by Schilling in the 2004 World Series, was among the collateral Schilling recently pledged to lenders, according to a document filed with the Massachusetts secretary of state’s office. 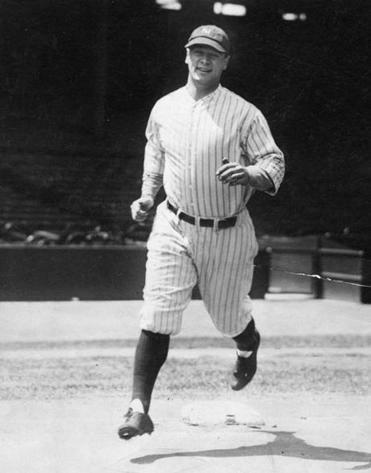 John La Liberte, a lawyer at the Boston firm Sherin and Lodgen, said the filing suggests that Schilling has probably agreed to sell or give up the sock and other memorabilia, including a cap worn by New York Yankees legend Lou Gehrig, as part of a settlement with the banks — though the public documents don’t provide details about the agreement. The banks and Schilling declined to comment. The bloody sock became part of Red Sox and baseball history when Schilling, suffering from a serious ankle injury, pitched seven innings to win the crucial sixth game of the 2004 American League Championship Series, when the Sox roared back from a deficit of three games to zero to take the seven-game series from the Yankees. Schilling threw out that blood-stained sock, but produced another by going six innings to win the second game of the World ­Series, which the Sox swept from St. Louis Cardinals. Former Boston Red Sox pitcher Curt Schilling said ‘‘I put myself out there’’ in personally guaranteeing loans to his failed video game firm. Schilling kept the second sock, which he lent to National Baseball Hall of Fame and ­Museum in Cooperstown, N.Y., where it is still on display. A spokesman for the Hall declined to say whether Schilling has requested that the item be returned. Sports memorabilia specialists estimate the sock could fetch as much as $25,000 if it ever goes to auction, although it’s difficult to put a precise value on such an unusual item. It’s also possible that ­enthusiastic fans could bid up the price much higher, said Phil Castinetti, who owns Sportsworld in Saugus, the largest sports memorabilia shop in New England. “It’s a one of a kind item,” Castinetti said. A David Ortiz jersey buried under the new Yankee Stadium in an attempt to curse the Yankees sold for $175,100 at a charity auction in 2008. The famous ball that dribbled through Bill Buckner’s legs in the Sox’s heartbreaking 1986 World Series loss to the New York Mets fetched $418,250 in April. But appraiser Mike Gutierrez, the consignment director for Heritage Auctions and a regular on the public television program “Antiques Roadshow,” said the value of the sock probably peaked in 2004 or 2005 when fans were still buzzing over the Red Sox victory, the team’s first championship since 1918. Schilling’s company, 38 ­Studios, filed for bankruptcy in June, listing more than $150 million in debts and less than $22 million in assets. ­Almost all the defunct Providence company’s assets are expected to go to the state of Rhode Island, which guaranteed a $75 million loan to the company, leaving other creditors with nothing. Among the collectibles Curt Schilling has pledged as collateral to lenders are a cap worn by Yankees legend Lou Gehrig. But Schilling personally guaranteed some loans related to 38 Studios, including as much as $9.6 million from Bank Rhode Island and $2.4 million from RBS Citizens, better known as Citizens Bank. In addition to the sock and Gehrig hat, Schilling also pledged as collateral his extensive collection of World War II memorabilia and stakes in his home and a private equity firm. The 45-year-old retired pitcher has already put his 26-acre Medfield estate on the market for $3.45 million. It is unclear whether the banks will be able recoup all the money they are owed. Gutierrez estimated that the Gehrig cap, worn while he played for the 1927 Yankees, considered one of the greatest teams in baseball history, would sell for at least $200,000. A 1930s cap worn by Gehrig sold for $151,000 in 1999. Schilling’s vast collection of World War II memorabilia includes two pieces on display at the National World War II ­Museum in New Orleans: a Luftwaffe parachute jump smock and an SS tanker jacket. Until recently, Schilling served on the museum’s board. It’s unclear how much his entire collection is worth. A museum spokeswoman declined to say whether Schilling has asked for any items back. Schilling also pledged the proceeds from his investment in a private equity fund, StepStone Capital Partners II Onshore LP. It’s not clear what that investment is worth. A spokeswoman from StepStone, which has offices in New York and several other locations, declined to comment. 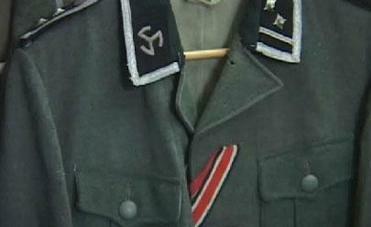 Schilling also may have to sell a German SS soldier’s uniform jacket. Earlier this year, Schilling pledged 1,600 gold coins worth an estimated $2.6 million to help secure a Bank Rhode Island loan — collateral that the bank has apparently sold. Brookline Bancorp, which bought Bank Rhode Island earlier this year, has written off much of the $7 million it is still owed for loans related to 38 Studios. Schilling has previously said that he poured as much as $50 million of his own money into 38 Studios, leaving him “tapped out.” On Tuesday, he was featured in an ESPN documentary about star athletes who burned through their fortunes.